With the declining trend of communicable diseases across the world, noncommunicable diseases like hypertension are posing as a major threat to public health. Hypertension is a modern day epidemic that comes with dire consequences such as coronary heart disease, cerebrovascular disease, heart failure, nephropathy, peripheral vascular disease, and retinopathy. The magnitude of hypertension in adults >25 years was around 40% in the year 2008. Hypertension has been reported to cause around 7.5 million deaths, that is about 12.8% of the total deaths in the world. The total population with uncontrolled blood pressure was around 1 billion in 2008. Risk of cardiovascular disease is doubled for every 20/10 mmHg rise of blood pressure. One study from the USA revealed that short duration of sleep led to increased blood pressure in middle-aged adults. Several studies have reported an association between short sleep duration and increased blood pressure., In children 11–17 years, sleep duration of <8 h was observed to be a significant risk factor for increased blood pressure in both boys and girls. Results of some studies have also shown that long sleep duration is also associated with an increased risk of hypertension. However, long sleep duration has also been found to be associated with a decreased risk of metabolic syndrome. A meta-analysis on the relation between sleep duration and blood pressure among adults revealed that both long and short sleep duration might be associated with increased blood pressure. It has been seen that water ingestion significantly decreases heart rate, systolic blood pressure, and cardiac workload in a time-dependent manner in adults. In another study, an increased fluid intake of 1.5 L for 6 months had no effect on men aged 55–75 years. The association of sleep duration and water intake has been reported from other countries, but very few studies have been conducted in the Indian population. Therefore, this study was conducted to determine the association between hypertension and sleep duration and water intake among young adults. This was a cross-sectional study conducted in Government Medical College, Kannauj from August 2017 to June 2018. Sample size was estimated using the formula, N = Z(1−α/2)2pq/d2; where α was taken at 5% level of significance; p = prevalence of hypertension = 38.97%;q = 100-p = 61.03%; and d = margin of error = 4%. Therefore, the minimum sample size obtained was 594. The study setting was the Govt. Medical College, Kannauj, affiliated to Chatrapati Shahuji Maharaj Medical University, Lucknow. The Institute offers an MBBS course of 4½ years and admits around 100 students in a year, for 4½ and 1 year of internship. All students who were present in class on the day of the interview and willing to be included in the study were selected. Written informed consent was obtained from the students. Ethical clearance was taken from the Institutional Ethical Committee. The data were analyzed for 596 students, 331 boys and 265 girls, aged between 17 and 22 years. Data were recorded on a pre-designed and pre-tested questionnaire. Data were collected regarding the following variables: age, family history of hypertension, physical activity, weight, height, and BMI, waist circumference, diet, smoking, tobacco consumption, alcohol consumption, self-reported duration of sleep during nighttime and during daytime and self-reported water intake in 24 h.
Data were compiled and analyzed using SPSS version 22.0. (SPSS Inc. Chicago, IL, USA) Quantitative variables were analyzed using mean and standard deviation. Multiple logistic regression analysis was done to study the association of various determinants with hypertension. Value of P < 0.05 was considered statistically significant. Receiver operator characteristic (ROC) analysis was performed to estimate the predictive validity, and to calculate the cutoffs of sleep duration and water intake. Area under the curve was calculated to estimate the diagnostic power of the test, and to study the probability that these parameters would identify participants with hypertension. Cutoffs were calculated by measuring the sensitivity and specificity of the sleep duration and water intake at different cutoff points. 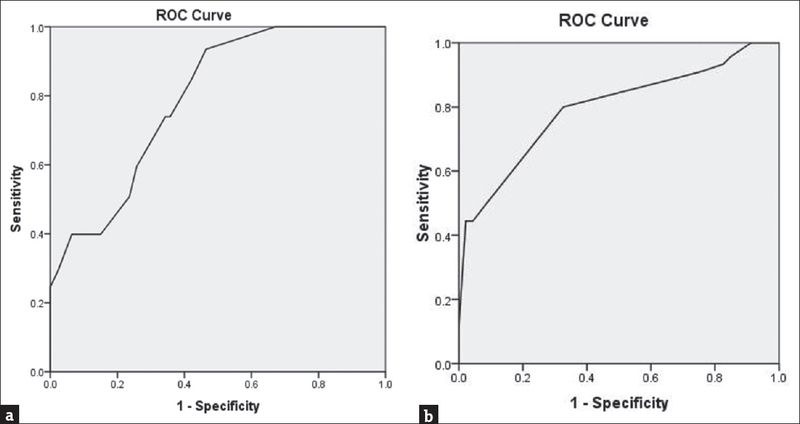 Youden index method was used to estimate the associated criterion with maximum sensitivity and specificity to predict hypertension. A total of 596 participants, 331 boys and 265 girls, were included in the study. Of the total 596 participants, 208(34.9%) had hypertension. Prevalence of hypertension among boys was 35.9% and among was girls 33.5%, respectively. Around 36.2% of study participants were normal, 28.9% had elevated blood pressure, 29.0% had Stage 1 hypertension, and 5.9% had Stage 2 hypertension [Table 1]. The mean age of boys was 20.7 ± 1.4 years and of girls was 20.5 ± 1.1 years. Boys had a mean BMI of 22.8 ± 7.5 kg/m2, whereas BMI of girls was 20.1 ± 6.9 kg/m2. The mean systolic blood pressure was 119.0 ± 9.6 mmHg among boys and 111.4 ± 10.2 mmHg among girls. The mean diastolic blood pressure was 80.6 ± 9.2 mmHg among boys and 77.8 ± 9.4 mmHg among girls [Table 2]. Upon univariate analysis, gender, family history of hypertension, BMI, waist circumference, physical activity, sleep duration at night time, and water intake were found to be significantly associated with hypertension, whereas age, diet, smoking, tobacco consumption, alcohol consumption, and sleep duration at daytime were not significantly associated. ROC analysis for sleep duration at nighttime showed the good predictive ability for hypertension for both boys and girls. Area under the curve was 0.721 for boys and the cutoff of sleep duration at night time to predict hypertension was estimated at ≤7.6 h [Figure 1]a. Area under the curve was 0.699 for girls and the cutoff of sleep duration at nighttime for predicting hypertension among girls was estimated as ≤7.1 h [Figure 1]b. The sensitivity and specificity of the cutoff for sleep duration at nighttime in boys was 79.3% and 74.2%, respectively, and that in girls was 81.5% and 75.6%, respectively. ROC analysis for water intake also showed that it was a good predictor of hypertension both for boys and girls. Area under the curve was 0.685 for boys and 0.784 for girls [Figure 2]a and [Figure 2]b. The cutoff for water intake to predict hypertension was estimated as ≤2.1 L for boys and ≤1.5 L for girls, respectively. The sensitivity and specificity of the cutoff for water intake in boys was 74.8% and 70.3%, respectively, and the same in girls was 78.3% and 71.5%, respectively. Young adults with longer duration of sleep during nighttime and more water intake had a lesser risk of hypertension. Multiple logistic regression analysis of the determinants of hypertension showed that BMI, waist circumference, physical activity, sleep duration at nighttime, and water intake were significantly associated with hypertension in young adults. For every 1 h increase in sleep duration at nighttime, there were a 0.944 times decrease in risk of hypertension and for every 1 L increase in water intake, there was a 0.931 times lower risk of hypertension. There was no significant association between hypertension and gender, and family history of hypertension [Table 3]. In the present study, of 596 participants, 208 (34.9%) had hypertension. Prevalence of hypertension among boys and girls was 35.9% and 33.5%, respectively. Around 36.2% of study participants were normal, 28.9% had elevated blood pressure, 29.0% had Stage 1 hypertension and 5.9% had Stage 2 hypertension. The prevalence was similar to that observed by Gupta et al. (33.4%) in the urban population of Jaipur city in north India. Anand also revealed a prevalence of 34.0% among professionals in Mumbai. The findings from a study in Lucknow city in north India also showed a prevalence of 32.8% among the urban population. Similar results have been reported by Reddy et al. (27.7%), Kaur et al. (27.2%), and Shanthirani et al. (21.1%).,, In the late 2000s, the prevalence of hypertension in the general population ranged between 20% and 40% throughout the decade. The high prevalence of hypertension in the present study was also due to the use of 2017 ACC/AHA definition of hypertension wherein the cutoff for hypertension was 130/80 mmHg as against the earlier cutoff of 140/90 mmHg according to the Joint national Committee (JNC)-8 classification. The results of this study will be useful while comparing with other studies carried out in the future that will be based on the new criteria. In the present study, lesser sleep duration during nighttime was associated with an increased prevalence of hypertension. For every 1 h increase in sleep duration at nighttime, there was a 0.944 (95% confidence interval [CI] = 0.875–0.989) times decrease in risk of hypertension. Our findings are in concordance with those from a Turkish study wherein after univariate binary logistic regression age-adjusted analysis, each unit increase in sleep duration (in h) in boys and girls, decreased the prehypertension and hypertension risk by 0.89 (95% CI = 0.82–0.98). In a study from the USA among adolescents (11–18 years), after adjustment for the duration of sleep during the day and other covariates, each additional hour of nighttime sleep was associated with a decrease in systolic blood pressure (β = −0.57; P < 0.0001). In a meta-analysis of prospective cohort studies, it was seen that short sleep duration was associated with a 1.21 (95% CI = 1.05–1.40) times higher risk of hypertension. Another meta-analysis including six prospective and seventeen cross-sectional revealed that short sleep duration was associated with a higher risk of hypertension (odds ratio [OR] = 1.20, 95% CI: 1.09–1.32, P < 0.001), especially among subjects younger than 65 years and females. In a cross-sectional study from China, among middle-aged and elderly population, the risk of hypertension prevalence was significantly increased (OR = 1.13, 95% CI = 1.03–1.24) among those who slept <7 h after adjustment for gender, age, BMI, cigarette smoking, sleep quality, and midday napping. However, in another meta-analysis on the association between the duration of sleep and hypertension among adults, it was found that excessively longer and shorter periods of sleep may both be risk factors for high blood pressure. This may be because elderly (>60 years), and middle-aged (45–60 years) groups were included in the meta-analysis, whereas our study was conducted only on young adults; therefore, only short sleep duration was found to be associated with increased blood pressure. A study from the USA also revealed that keeping the weekday total sleep time similar, participants aged 6–18 years who were hypertensive were found to have obtained less weekend catch up sleep. Hence, we can also assume that compensatory sleep hours may decrease the risk of hypertension. 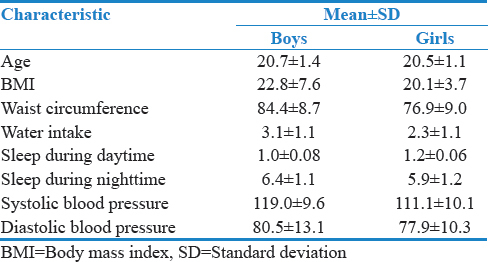 The cutoff of sleep duration at night time to predict hypertension was observed to be as ≤7.6 h among boys and ≤7.1 h among girls. On the basis of this study, we recommend that minimum duration of nighttime sleep for young adults should be 7 h to prevent hypertension. This nonpharmacologic intervention may be included among lifestyle modifications advised as part of the guidelines for the prevention of hypertension among adults as laid down under the National Programme For Prevention and Control of Cancer, Diabetes, Cardiovascular Disease and Stroke. In the present study, lesser water intake during 24 h was associated with an increased prevalence of hypertension. A study from Switzerland has reported that following ingestion of drinking water, an acute and temporary lowering of heart rate, systolic blood pressure and rate pressure double product (heart rate multiplied by systolic blood pressure) occurs, thereby decreasing cardiac workload in a time-dependent fashion. These results are in concordance with those of other studies which have reported decreased heart rate, and decreased rate-pressure double product in response to water ingestion, in healthy adults. None of the studies have observed the effect of 24 h water intake on the occurrence of hypertension. In the present study, the cutoff for water intake to predict hypertension was estimated as ≤2.1 L for boys and ≤1.5 L for girls, respectively. Although enough evidence from other researchers is not available for the association of 24-h water intake with hypertension, further studies need to be done to assess the association between daily water intake and hypertension. One of the limitations of the study is that the measurement of blood pressure on a single day may not be truly representative of the prevalence of hypertension in the study participants. This is a limitation inherent in the cross-sectional study design and is present in all other studies with a similar design. The use of 2017 ACC/AHA definition of hypertension as against the older JNC-8 criteria is another limitation. Self-reported 24-h water intake does not account for the amount of fluids present in foodstuffs forming part of the diet. Although sleep duration has an effect on blood pressure, quality of sleep, sleep pattern, and duration of REM and NREM sleep may be independent risk factors for hypertension, which need to be studied in detail. Since the present study involves self-reported data for water intake and sleep duration, lack of an objective measurement of these parameters is a limitation of the study. However, our findings corroborate with the results of other studies, which highlights the fact that further research is required to quantify the influence of these physiological parameters on hypertension in our population. The present study reveals that at least 7 h sleep duration at night time is a cost-effective nonpharmacologic intervention for the prevention of hypertension in young adults. A minimum daily water intake of 1.5 L is recommended to decrease the risk of hypertension among young adults in the Indian population. Available from: http://www.who.int/gho/ncd/risk_factors/blood_ pressure_prevalence_text/en/. [Last accessed on 2019 Jan 29]. Gupta R, Gupta VP. Hypertension epidemiology in India: Lessons from Jaipur heart watch. Curr Sci 2009;97:349-55. Gangwisch JE, Heymsfield SB, Boden-Albala B, Buijs RM, Kreier F, Pickering TG, et al. Short sleep duration as a risk factor for hypertension: Analyses of the first national health and nutrition examination survey. Hypertension 2006;47:833-9. Shivashankar R, Kondal D, Ali MK, Gupta R, Pradeepa R, Mohan V, et al. Associations of sleep duration and disturbances with hypertension in metropolitan cities of Delhi, Chennai, and Karachi in South Asia: Cross-sectional analysis of the CARRS study. Sleep 2017;40:1-10. doi.org/10.1093/sleep/zsx119. Deng HB, Tam T, Zee BC, Chung RY, Su X, Jin L, et al. Short sleep duration increases metabolic impact in healthy adults: A population-based cohort study. Sleep 2017;40:1-11. doi.org/10.1093/sleep/zsx130. Bal C, Öztürk A, Çiçek B, Özdemir A, Zararsız G, Ünalan D, et al. The relationship between blood pressure and sleep duration in Turkish children: A cross-sectional study. J Clin Res Pediatr Endocrinol 2018;10:51-8. Shankar A, Charumathi S, Kalidindi S. Sleep duration and self-rated health: The national health interview survey 2008. Sleep 2011;34:1173-7. Najafian J, Toghianifar N, Mohammadifard N, Nouri F. Association between sleep duration and metabolic syndrome in a population-based study: Isfahan healthy heart program. J Res Med Sci 2011;16:801-6. Monnard CR, Grasser EK. Water ingestion decreases cardiac workload time-dependent in healthy adults with no effect of gender. Sci Rep 2017;7:7939. Spigt MG, Knottnerus JA, Westerterp KR, Olde Rikkert MG, Schayck CP. The effects of 6 months of increased water intake on blood sodium, glomerular filtration rate, blood pressure, and quality of life in elderly (aged 55-75) men. J Am Geriatr Soc 2006;54:438-43. Kumar U, Sharma OP, Goyal J, Sain S, Gupta B, Rajendra GA. Prevalence of hypertension among young adults in a Jaipur district of Rajasthan, India. Int J Community Med Public Health 2017;4:424-7. Available from: https://www.acc.org/latest-in-cardiology/articles/2017/11/08/11/47/mon-5pm-bp-guideline-aha-2017. [Last accessed on 2019 Jan 29]. Anand MP. Prevalence of hypertension amongst Mumbai executives. J Assoc Physicians India 2000;48:1200-1. Midha T, Idris MZ, Saran RK, Srivastav AK, Singh SK. Prevalence and determinants of hypertension in the urban and rural population of a North Indian district. East Afr J Public Health 2009;6:268-73. Reddy KS, Prabhakaran D, Chaturvedi V, Jeemon P, Thankappan KR, Ramakrishnan L, et al. Methods for establishing a surveillance system for cardiovascular diseases in Indian industrial populations. Bull World Health Organ 2006;84:461-9. Kaur P, Rao TV, Sankarasubbaiyan S, Narayanan AM, Ezhil R, Rao SR, et al. Prevalence and distribution of cardiovascular risk factors in an urban industrial population in South India: A cross-sectional study. J Assoc Physicians India 2007;55:771-6. Shanthirani CS, Pradeepa R, Deepa R, Premalatha G, Saroja R, Mohan V, et al. 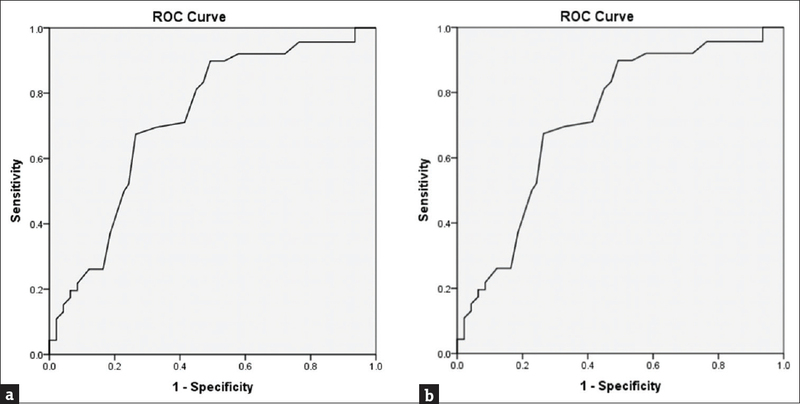 Prevalence and risk factors of hypertension in a selected South Indian population – The Chennai urban population study. J Assoc Physicians India 2003;51:20-7. Meininger JC, Gallagher MR, Eissa MA, Nguyen TQ, Chan W. Sleep duration and its association with ambulatory blood pressure in a school-based, diverse sample of adolescents. Am J Hypertens 2014;27:948-55. Meng L, Zheng Y, Hui R. The relationship of sleep duration and insomnia to risk of hypertension incidence: A meta-analysis of prospective cohort studies. Hypertens Res 2013;36:985-95. Wang Q, Xi B, Liu M, Zhang Y, Fu M. Short sleep duration is associated with hypertension risk among adults: A systematic review and meta-analysis. Hypertens Res 2012;35:1012-8. Wang D, Zhou Y, Guo Y, Zhang R, Li W, He M, et al. The effect of sleep duration and sleep quality on hypertension in middle-aged and older Chinese: The Dongfeng-Tongji cohort study. Sleep Med 2017;40:78-83. Gupta N, Maranda L, Gupta R. Differences in self-reported weekend catch up sleep between children and adolescents with and without primary hypertension. Clin Hypertens 2018;24:7. Girona M, Grasser EK, Dulloo AG, Montani JP. Cardiovascular and metabolic responses to tap water ingestion in young humans: Does the water temperature matter? Acta Physiol (Oxf) 2014;211:358-70. Routledge HC, Chowdhary S, Coote JH, Townend JN. Cardiac vagal response to water ingestion in normal human subjects. Clin Sci (Lond) 2002;103:157-62.